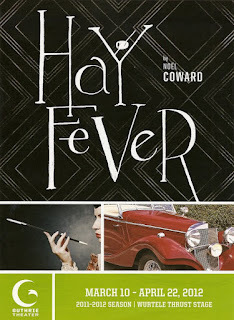 Noel Coward's play Hay Fever is one of those plays that you go to for pure enjoyment. There's not much that's deep or thought-provoking about it, but not every play has to be. It's just a delightfully silly romp through the life of a wealthy, spoiled, eccentric family. Judith Bliss is a recently retired stage actress, who continues to live her life as if she's on the stage. Everything is a production; she creates drama just to be able to act it out. Her husband David is a novelist who spends most of his time in his study. Their children are, as expected, spoiled and privileged and as dramatic as their mother. The Bliss family has a "country house" outside of London, and each member of the family invites a friend out for the weekend, without telling any of the others. They're terrible hosts, alternately ignoring and insulting their guests. Each of the four guests has their own reason for accepting the invitation to the country; this is a wealthy and famous family whom everyone wants to know. 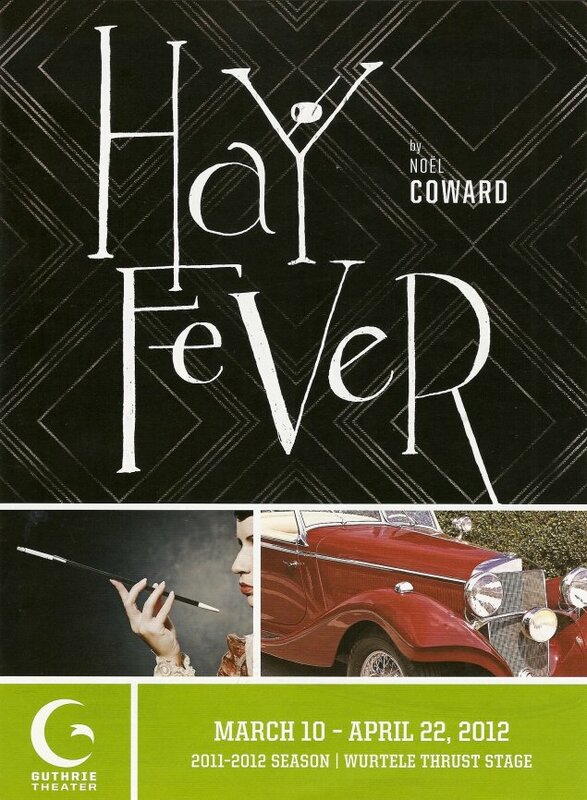 But they soon learn that the Bliss family is not so pleasant to be around, despite their eccentrically charming home. This is a dream cast of Guthrie veterans, returnees, and newcomers. The most veteran of the cast is Barbara Bryne as the family's servant, who steals every scene she's in. TV and Broadway actor Harriet Harris returns to the Guthrie to play Judith (she most recently appeared in The Glass Menagerie in 2007, I also saw her in another Noel Coward play, Present Laughter, opposite Victor Garber on Broadway a few years ago). She is deliciously over the top as Judith must be, milking every moment of drama for the greatest effect. Simon Jones is another TV and Broadway vet returning to the Guthrie (most recently seen in Shadowlands in 2008), playing the family patriarch, a sort of straight man to the craziness around him. Cat Walleck, a newcomer to the Guthrie, is fierce and funny as Sorel Bliss, very much her mother's daughter. Completing the family is Guthrie fave John Skelley as Simon Bliss. He has such an easy, natural charisma on stage that he is, as always, a joy to watch. Add to all that the perfectly cast guests, and it's a wonderful, tight, ensemble that plays the histrionics and awkward silences equally well. 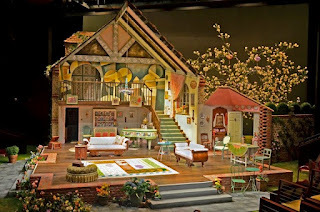 I recently said that the set of The Birds, in the Guthrie's studio theater, was the most detailed set I'd ever scene. 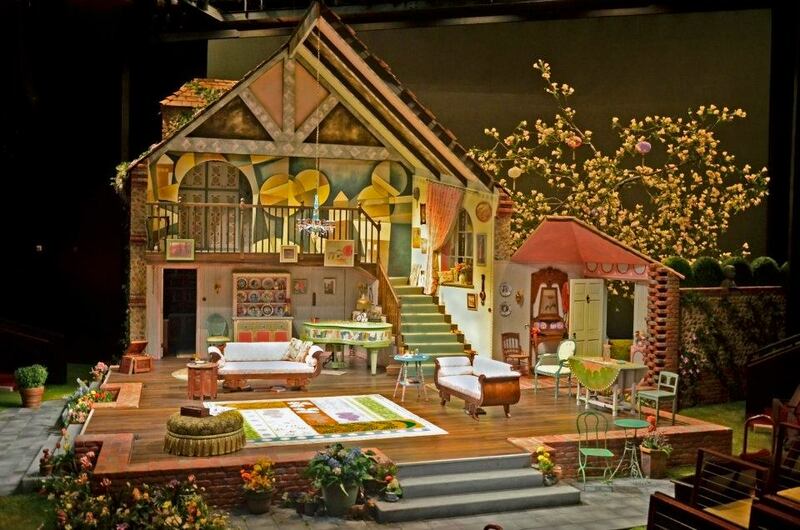 I might have to amend that statement after seeing this set, except that in The Birds the details are crammed into a small space, while the Bliss house expands over the large thrust stage, including huge brick exterior walls and flowers in the garden as well as the busy interior. Every surface of the home is painted or covered in a charming, eccentric style. Janet Bird designed both the set and the gorgeous 1920s period costumes, and the look is delicious. She and the director, Christopher Luscombe, appear to be transplanted from London's West End for this production, perhaps adding to the delightful British-ness of the play. A fabulously talented cast, a classic play, beautiful set and costumes - just another night at the Guthrie.